Every spring a new mega-pipeline is proposed to quench the thirst of arid corners of Asia. This year, Chinese urban planners proposed building a 2,000 kilometre pipeline to pump water from Siberia to relieve shortages in the parched north-western city of Lanzhou. The Lanzhou Urban and Rural Planning and Design Institute released plans for the project in February as part of its "Vision for Urban Planning 2030". The scheme would divert water from Lake Baikal, the world’s deepest freshwater lake, and pump it at least one kilometre uphill to the capital of Gansu province, reported the Global Times. The plan has been met with criticism and was later removed from the website of the Lanzhou institute. Experts have questioned the scheme’s environmental impacts, economic rationale and political feasibility. This is only the latest in a series of proposals to export surplus water from Russia and Mongolia to China. 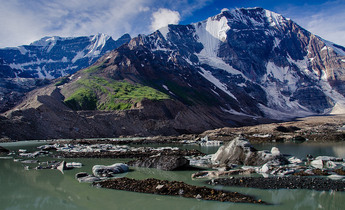 In 2015, Russian minister of agriculture Alexander Tkachev promised to divert water through Kazakhstan to Xinjiang, another dry area of north-western China. In 2013, Mongolia’s president Taskhiagiin Elbegdorj pledged to supply water to Inner Mongolia. Siberia’s Lake Baikal has repeatedly been proposed as the diversion point for these trans-Asia water pipes. The lake holds 20% of the earth’s freshwater supplies and harbours at least 2,500 species, most of them found nowhere else. Chinese businessman Bian Hongdeng, who owns dozens of mines in Mongolia and Inner Mongolia, was the first to propose a diversion in the early 2000s. Bian’s initial idea was to divert water from several rivers in northern Mongolia, including the Selenga River that flows into Lake Baikal, to arid areas of southern Mongolia and then on to China. In 2005, Bian announced he was also considering the feasibility of diverting water from Lake Baikal to China although this was denied by China’s Ministry of Water Resources and proponents were forced to drop the project. Nonetheless, the idea surfaced again in 2007 and 2010. 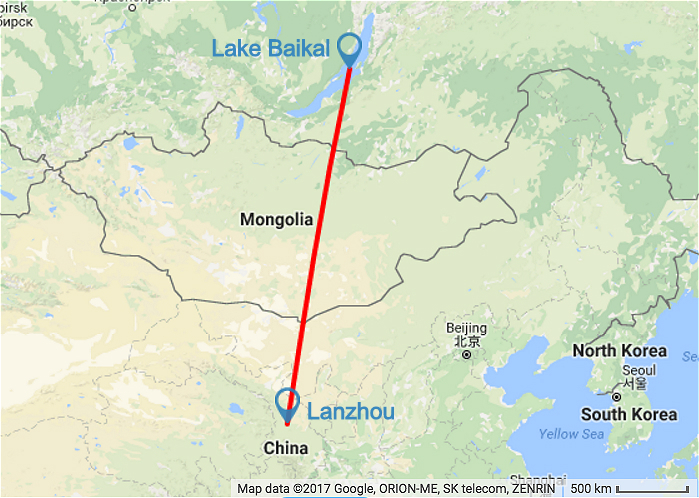 Chinese experts have raised concerns about the most recent Baikal-Lanzhou diversion, from questions over the willingness of industrial users to pay for the water in Gansu, to the ecological impacts on the lake itself. 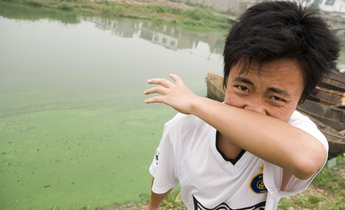 Shi Weixin, chief designer of China’s South-North water transfer project has warned of the need to minimise environmental impacts. 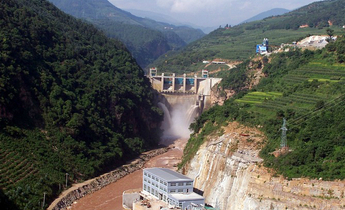 This caution is especially notable as Shi has worked on one of the world’s biggest engineering feats – the US$48 billion (331 billion yuan) scheme to divert water from the Yangtze to the Yellow River. Russian experts have fewer objections to the scheme. "Ok, fine, there is plenty of water in the lake, but how will they transport it across the mountains?" said Mikhail Grachev, head of the Limnology Institute in Irkutsk, the largest city in Baikal Region. This shows the lack of understanding of the impact of water diversions. The largest water-pipeline system in the world – the "Great Manmade River" of Libya – supplied about 1.3 cubic kilometres of water a year to Tripoli and several other cities. It brought water through over 1,000 kilometres of pipelines from Nubian aquifers. A similar intensity of withdrawal from Baikal would take away only 2% of the lake's outflow, reducing the water depth by about five centimetres. Grachev and many other academics consider such levels of withdrawal safe for the Lake Baikal ecosystem, but there has been no systematic research on the ecologically safe limits of withdrawal. An environmental activist from Baikal Interactive Ecological Centre in Irkutsk, Maxim Vorontsov, is more concerned with the impacts on the Baikal coastline from pipeline construction and other structures, as well as the heavy toll on forests and rivers that it would transverse. Environmentalists in Baikal are dealing with more imminent threats to the wellbeing of Lake Baikal, which is a UNESCO world heritage site. 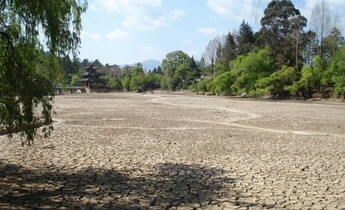 These include an unprecedented 23-year long drought that led the lake to drop below critical water levels; massive algal blooms likely caused by untreated wastewater from coastal settlements and tourist resorts; haphazard development of tourist camps and villas that are partly fuelled by a ten-fold increase in tourists from China; a drastic decline of fish stocks caused by drought, overfishing and pollution; and disastrous forest fires along the lake shore in 2015-16. Mongolia’s aggressive push to build three large reservoirs on the Selenge River system is also a risk because it’s the main source of water for the lake. There are important lessons emerging from a much less ambitious project nearby. Mongolia has undertaken a feasibility study funded by the World Bank to build a dam on the Orkhon River, which flows into Lake Baikal, in order to pump water 750 kilometres underground to the massive mines of the Southern Gobi region. Environmental groups insist that the public in Mongolia and Russia should be consulted on the plan for environmental assessment of the Orkhon-Gobi dam project before work is started. The first round of consultations took place in Buryatia Republic in Siberia at the end of March. At the hearings, local people condemned the project, arguing they were already suffering from drought, and that Russian dams on the Angara River had affected fisheries, navigation, and the quality and quantity of water supply. People called for an assessment of the cumulative impacts of any future projects – including the Baikal-Lanzhou pipeline – with the understanding that Lake Baikal is already on the brink of ecological crisis. Disregarding expected environmental impacts when trying to convince local populations – who believe the lake of be sacred – of the need for Baikal-related large water infrastructure will be a very hard task. On top of this, the economics of long-distance water pipelines don’t add up. 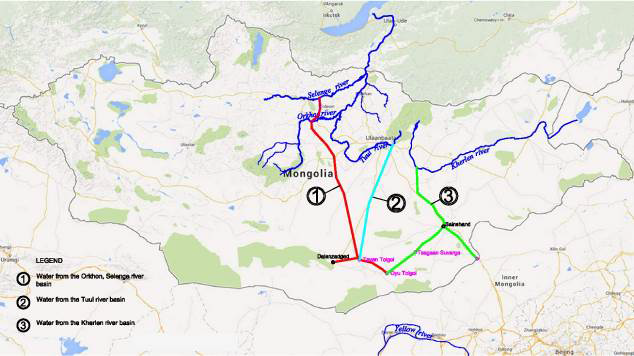 A recent 2030 Water Resources Group report shows that increasing water efficiency in Gobi would be a cheaper alternative to the Orkhon-Gobi pipeline, which is three times shorter than the proposed Baikal-Lanzhou pipedream. Reducing demand and improving groundwater management could satisfy water needs in the Gobi area with annual investment 6-7 times lower than the pipeline (estimated to cost US$1.3 billion (9 billion yuan) with annual maintenance costs of US$75 million (517 million yuan) and annual withdrawal less than 80 million cubic metres). Assuming a similar diversion volume, and given the greater length of the Baikal-Lanzhou pipeline, the project costs could be 5-20 times greater than the Orkhon-Gobi pipeline. Is water the next resource-curse for Russia? Environmental journalist Semyon Laskin once optimistically stated that exporting freshwater from Baikal is less environmentally harmful for Russia than exporting oil, coal, ore and timber. Gabriel Eckstein, professor at the Texas A&M University School of Law, reviewing the subject of "bulk water transfers" at the 2015 World Water Forum, suggested these large scale projects “breed unsustainable economic development and create politically challenging dependencies, and may reinforce the commodification of water, which some view as anathema to the human right to water”. While water transfers may boost international cooperation and facilitate health and economic well-being, these schemes raise a variety of concerns, “including the de-watering of ecosystems and the energy needs and greenhouse gas impacts” of transporting water over great distances. Based on evidence from the oil and gas sectors, Eckstein raised the concern that countries selling water may face slower rates of development compared with those countries buying it. Many environmental activists, politicians and scientists in Russia share this concern. So far Russia's cooperation with China in the context of its One Belt and Road Initiative has deepened the country’s reliance on exports of natural resources and other forms of unsustainable development. 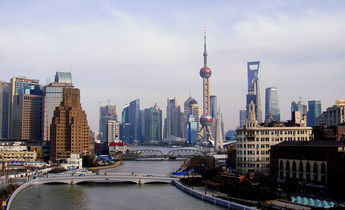 China invests in resource extraction projects in Russia, rather than more sophisticated infrastructure and production of consumer goods, the "New Russia" political movement leader Nikita Isaev told Rambler Information Agency. While China will clearly benefit from projects like the Baikal-Lanzhou pipeline, benefits for Russia are questionable and therefore Russia should stop developing this pipeline project, Isaev argues. 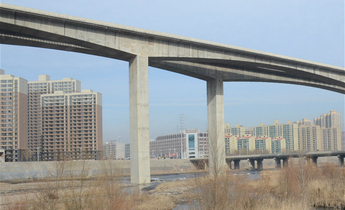 Large scale Chinese investment in unsuitable localities has already led to problems. For example, the Amazar Pulp and Saw mill in nearby Zabaikalsky province was half-built in a tiny settlement on the Trans-Siberian Railroad, where there is insufficient wood to provide a sustainable supply, or local workforce. This inevitably results in destruction of intact boreal forests at the expense of indigenous communities and planned protected areas. At Baikal’s lakeshores, an anticipated growth in tourism poses similar threats. In 2016, Chinese businessmen pledged to invest US$11 billion (76 billion yuan) into several resorts catering to millions of Chinese tourists. However, officials fear that the local community does not have the capacity to absorb investments in a sustainable manner. Baikal is a unique and fragile ecosystem. While we do not yet understand the environmental impacts of giant water diversion, "the Sacred Sea" of Siberia deserves a more innovative and sustainable approach to development. A deal to build a 2,600-kilometre pipeline through the Altai Mountains, home to rare species like the snow leopard, could be finalised within a month.